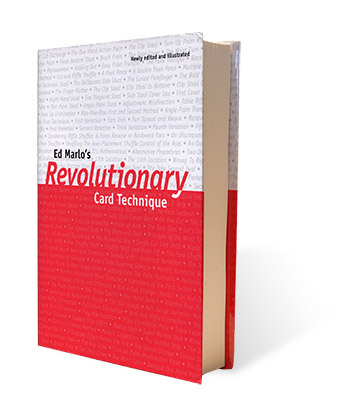 Here it is-the legendary Ed Marlo's entire Revolutionary Card Technique series all together in one volume! With over 500 pages, more than 1000 illustrations and 14 chapters covering all aspects of advanced manipulation, this is the most complete single reference book on Ed Marlo's card magic available. Each individual booklet that this book is comprised of was a classic in its time and is still an essential volume for any serious card worker's library. The booklets contained impressive new technique that are still now, fifty years later, some of the best, most advance technique available. In this sense, Marlo was truly ahead of his time. Newly edited and illustrated for clarity and ease-of-use, the wealth of information contained can elevate your card work to new heights. This is, hands down, the best book on card technique that there is. It's not debatable. It just is. If you disagree, then you're wrong. Prepare to dedicate your life to this book! I am not kidding! It's that good. While this is a book of technique there are applications to these techniques throughout these wonderful manuscripts of Marlo's. Be warned though, only serious magicians should study this. It is not for the 'dabbler' or somebody that hates to practice. This book will challenge you and give you many sleepless nights. However, if you keep the faith and put the work into the techniques, you will be handsomely rewarded. It's been a little over two years since I purchased this wonderful tome, but every time I study something in here, I always take something valuable away. Thank you Ed Marlo! An big bang of cards moves that you will use all the time! Each time you need a move this book have it for you! History and theory! Ace comes to my mind!and it clean and clear for any age to read ! TL;DR - If you have a card problem, Marlo has already thought of a solution(s), and it's probably in this fantastic book. Long Version - The center deal has eluded me for over 20 years. Having small hands (I can barely palm a card without it leaking), most of the center deal methods I've encountered were frustratingly infeasible for my particular situation. Until I got RCT. Within its pages, I've happily found a method that is, with some minor adjustments, finally workable for me (i.e., The Step Center Deal). My technique still needs a lot of work, but I'm light years closer to a serviceable center deal than I ever have been. No stone is left unturned. Every move in the book is broken down in painstaking detail: every finger position, every pressure point, every pivot point. Multiple methods and handlings are offered for each sleight. In other words, this book is complete. I'll echo what another reviewer posted - RCT is for the *advanced* card student. Noobs to card magic: work through The Royal Road to Card Magic first, then come back to this in a few years. Seriously. Add my name to those who've already given RCT their highest recommendation!